Tactics and Statistics | What makes Atletico Madrid so special? Atletico Madrid beat Bayern Munich on away goals and booked their tickets for the Champions League final in San Siro. Dogged defensively, anomalous statistically and flexible tactically, the Atletico Madrid side is a rare breed. But what is it that sets them apart, what makes Simeone’s men special? On 17 May, 2014 Atletico Madrid travelled to the Camp Nou on the final day of the season, leading Barcelona by 3 points. Cesc Fabregas, then playing for Barcelona, chipped a pass to Messi. The Argentine’s chest-pass to fellow South American Alexis Sanchez was then smashed into the net before Thibaut Courtois could move an inch. Barcelona led from there and were on course to winning the league. But if there is something about Diego Simeone’s Atletico Madrid that stands out, it is character. They refused to budge and soon Diego Godin’s header cancelled out Sanchez’s opener. Atletico held on and were crowned champions at the final whistle. There was disbelief among the players. And ecstasy. On that day two years ago, Diego Simeone held his head high and soaked in the applause by the Nou Camp crowd. The reception was fantastic considering the home side had just lost what was a very winnable title. Yet they appreciated and revered what El Cholo (Diego Simeone’s nickname) and Atletico had achieved. But when three weeks back, the same side (well not really same) eliminated the defending European champions Barcelona from the Champions League at the quarterfinal stage after a 2-0 win, the Barcelona fans wouldn’t greet them with panache anymore. Atletico’s meteoric rise was no spring in the pan. And it started to gravitate. More so after Tuesday night, when Simeone’s men reached a second Champions League final in three years, eliminating heavyweights Bayern Munich in the process. Just like the quarter-final win over Barcelona, Atleti were the underdogs in the semis too according to most. But that’s the thing about Atletico’s growth in stature, it continues to go under the radar somehow. Yet they are second in the La Liga, tied on points with top-placed Barcelona after a 1-0 weekend win over Rayo. That win saw Atletico keep a 136th blank in 258 games under Simeone. 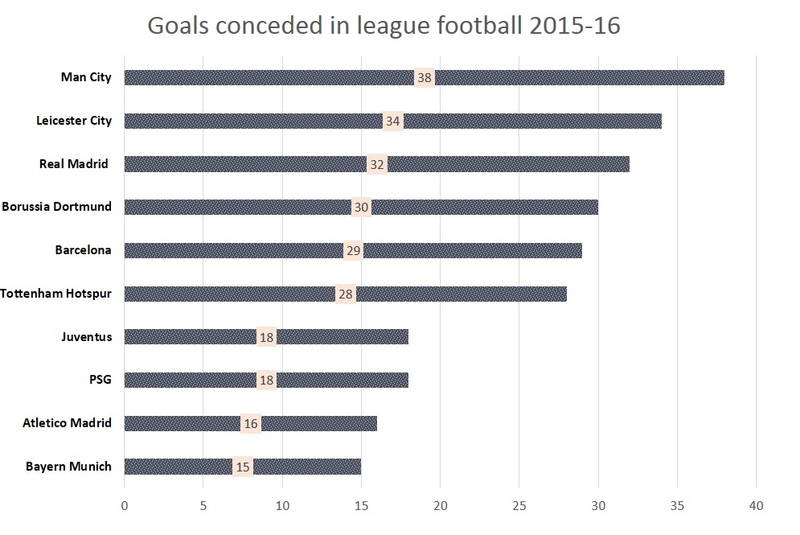 16 goals conceded in 36 Liga games this season seems anomalous stuff. So much so that they seem made up. Something has to be wrong with those numbers. But as Bayern found out last Wednesday, and many teams before them have, scoring against Atletico is a feat in itself, let alone winning a match. You can out-pass Atletico, you can out-possess Atletico, but you surely cannot outlast Atletico. From a team that would concede 3-4 goals against the likes of Espanyol and Levante without any remorse, to this video-game-like well-oiled machine, what changed? When Diego Simeone won the Argentine league managing Estudiantes, ending the club’s 23-year old drought, Roberto Perfumo, the former Argentina international, called him a “born leader”. Little did he know, Simeone will go on to become one of the best managers in Europe, and in the world, in just a few years’ time. Atletico kept 6 clean sheets in Simeone’s first 6 La Liga games in charge and it was only a signal of things to come. Defensive solidity is grilled into the side by a manager who likes to live life on the edge. Simeone is a mad man, a borderline lunatic manager who wears black and barks instructions from the touchline. His antics have suddenly come under the scanner. From his ball-boys throwing a ball onto the pitch to stop a counter to his crazy dash after taking the lead versus Chelsea. But all that taken into account and more, Diego Simeone has given Atletico Madrid an identity and built them in his own reflection. Discipline, heart, belief and desire started to brim at a club that had only too often looked brittle to the point of being volatile. If Simeone were to write a coaching manual it would probably have 3 words in loop: defence, organization, and tempo. Which is why it’s understandable when people think Simeone is Jose Mourinho’s second coming. Not to speak about Simeone’s nonchalance with the media. After their win in the Champions League semis against Chelsea in 2014, Simeone had quipped, “Thank you to the mothers who gave birth to these Atleti players… their sons have massive balls.” But the comparisons end there and couldn’t be any more off the mark. Yes, Atleti play deep, yes they surrender possession to maintain their defensive shape but their style is fundamentally different from what Mourinho professes--the team that possesses the ball less makes lesser mistakes. From an ideal and neutral standpoint, it seems very logical. And it is. But Simeone goes two steps further. Mourinho’s iconic Chelsea and Inter sides would absorb pressure to the point of saturation. Simeone’s Atleti believe in winning the ball—doesn’t matter where on the pitch. 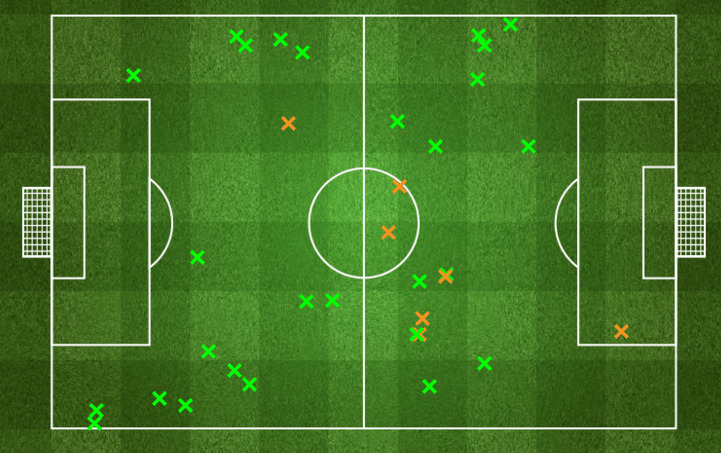 Simply put, Atletico win or tackle mostly on the flanks, while centrally there is nearly no tackle made. Why? The Atletico system is nothing fancy like the 2-3-3-2 sometimes deployed by Pep Guardiola, nor does it fall so deep that it becomes a 4-6-0 la Mourinho. Simeone prefers a 4-4-2, and that is the shape they are in with or without the ball more often than not. Though this is not the traditional 4-4-2 where full backs maraud at will, wingers take to the byline and feed the strikers. Simeone’s 4-4-2 is a boxed formation, such that they crowd the centre of the pitch, forcing opponents to go wide. Wingers sit closer to the centre of the pitch than the sidelines and there are always 2 banks of 4. Led by the quick Antoine Griezmann, it is no surprise that the defence or the midfield look for the Frenchman to break free and thus the passes in the final third are mostly long in nature. 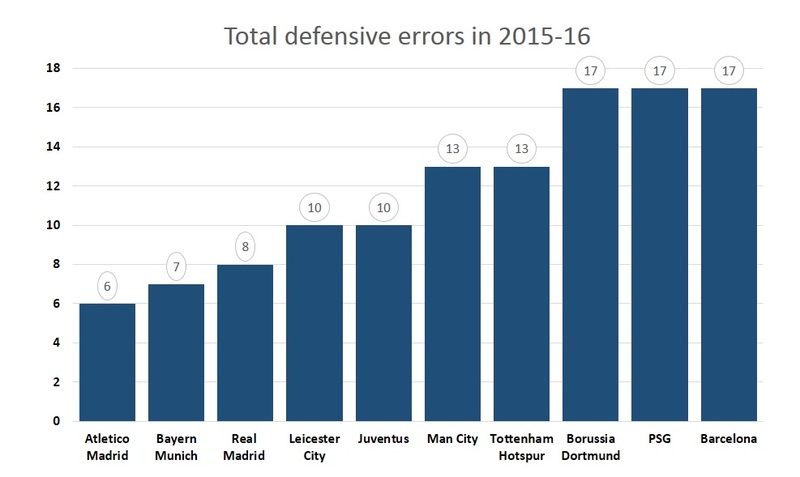 Add to that the happy-to-surrender possession approach and the Red-and-whites are one of the most dangerous teams in Europe. Almost like a python, inviting and cuddling its victim into its clutches before silently applying the choke. But then long ball football is conspicuously sprinkled with smart counter-attacking football. Although the guile and sublimity in attack has only come over time. 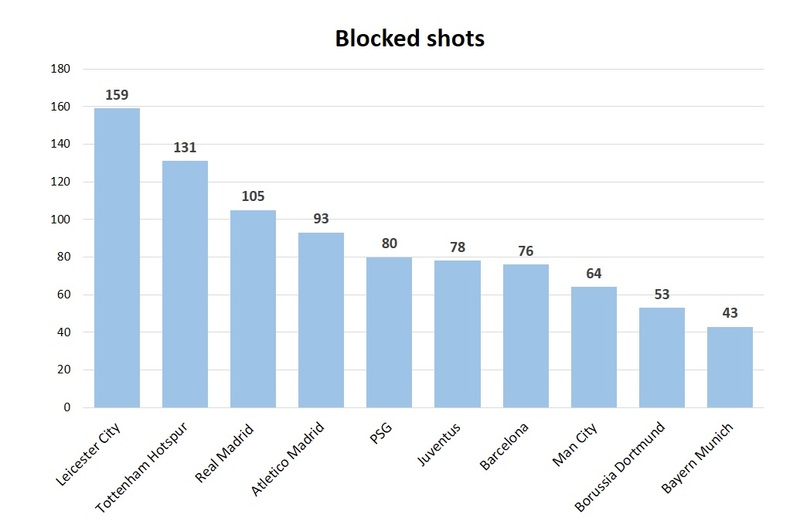 In the 2014-15 season, Atleti scored 35 out of their 67 goals from set-pieces. This season? Only 11 out of 60. Further testimony to the fact that Diego Simeone and his men continue to evolve and adapt. Costa and Falcao have changed to Torres and Griezmann. Miranda and Turan’s boots have been filled by Jiminez and Saul Niguez. Jackson Martinez came and went, Filipe Luis went and came, but Atletico and Simeone continue to traverse an upward trajectory. 'Tackling is not really a quality, it's more something you are forced to resort to when you don't have the ball,' words spoken by Xabi Alonso to The Guardian back in 2011. Atletico have spent the last 4 years doing everything in their powers to prove the Spanish international wrong. Diego Simeone during his playing days was the typical blood-and-thunder midfielder as most England fans will remember (Hello David Beckham! ), and he has engrained every quality of his in the Atletico fabric. The Spanish club tackle and how. 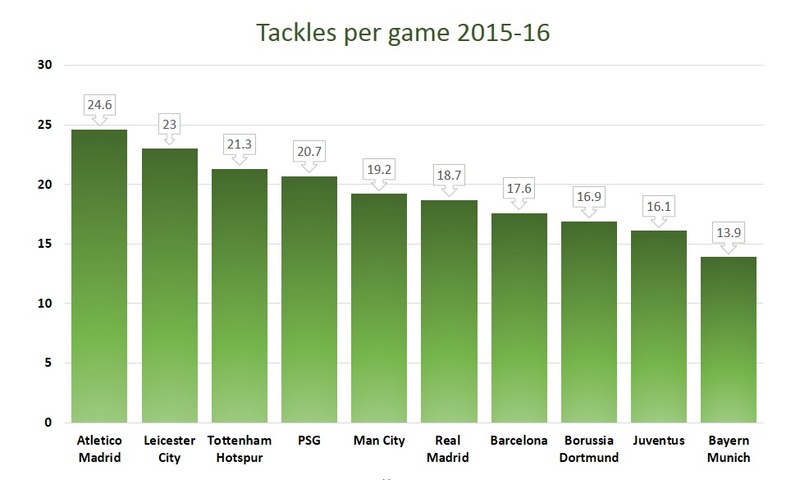 They are the leading club in number of tackles across the top 5 European leagues and compare mightily with the best from Europe. 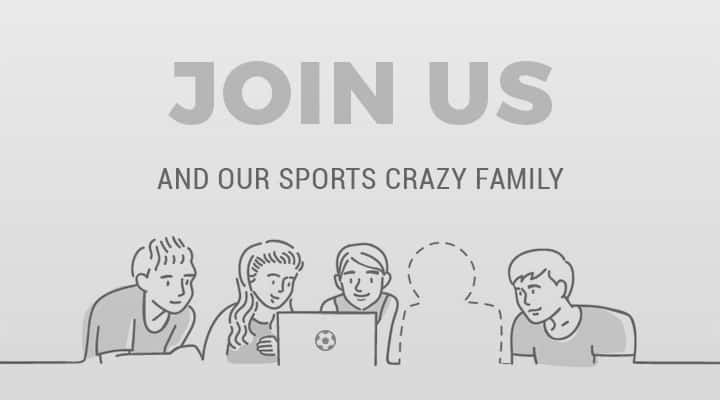 "Defending is an art – everybody has forgotten it - it's a tactical art to be able to sense danger and block crosses and get your toe in without fouling and they are very, very good at it." Big Sam Allardyce is a delight with a mic in hand and these lines of wisdom spoken after the first leg of the semi-final last week, underline exactly where Simeone and his men have got it right at the back. Defensive shape and organization are things that can still be coached, but discipline in terms of errors is one of those intangible qualities that only come around by staying on your feet and remaining conscious of the danger at hand. “The best moment to win the ball is immediately after your team just lost it,” Jurgen Klopp explained after taking charge of Liverpool. 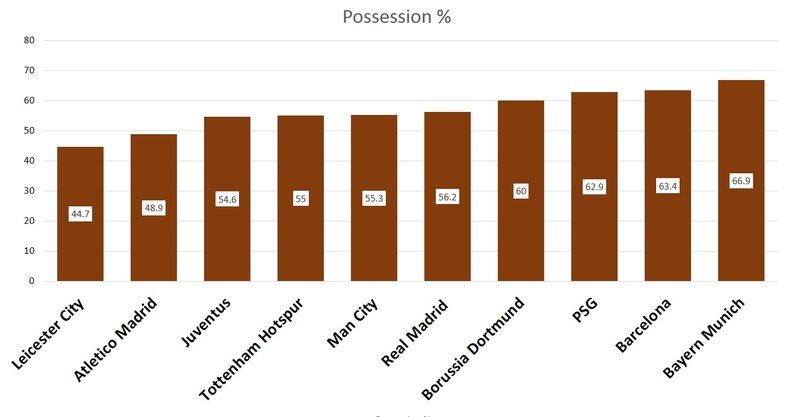 The importance of pressing has become paramount over the past 5 years. Perfected by Klopp and Guardiola at Dortmund and Barcelona respectively and now improvised by Simeone at Atletico, high-intensity pressing is a sight to behold. 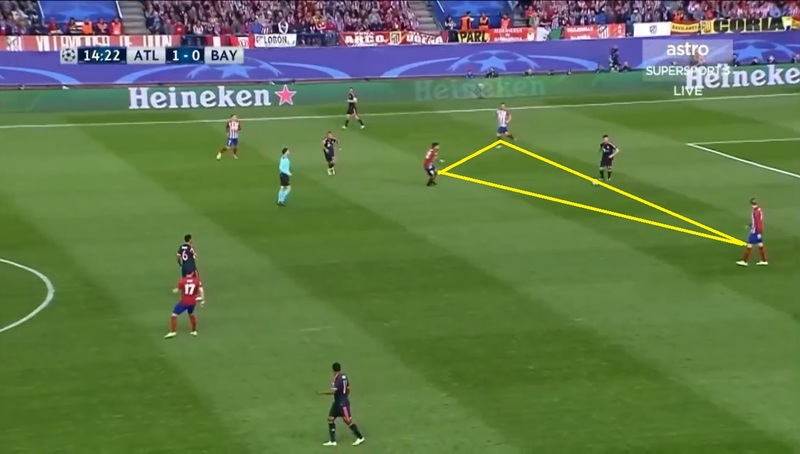 Hunting in packs, the Atletico pressing system is not like the traditional one and this is where the method to their defensive madness meets the eye. Interestingly it is not always that Simeone’s orders his men to press. Sometimes they are happy to sit deep and defend (as they did vs Barcelona in the first leg), and at others they are instructed to press as high up the pitch as possible (Bayern 1st leg). And sometimes they strike a balance. When Diego Simeone uses his forwards to press the opposition high up the pitch and deprive them of time on the ball, the opposition is mostly one that likes to build from the back or deeper parts of the field. In other cases, when the wings are overloaded and there are 2 wingers who are crowding one wing, the full backs would man-mark the wide players and sometimes sacrifice space in central areas. Now that is something that contradicts their basic philosophy of clobbering the centre of the pitch right? Wrong. The basic idea is to eventually concede space in order to curb space. Complex? Watch these GIFs below to gather what that means. Notice the blocked passing corridors. This is where Simeone excels and has an edge over his contemporaries. He’s flexible. In the second leg against Bayern, when the German side were pushing Atletico to the limit and had almost unhinged the otherwise strongly pivoted defence, Simeone changed his formation from a 442 to a 433, adding a man in attack, but more importantly prevent Vidal and Alonso from roaming free through the centre. What also makes Cholo special is that he is reactive and proactive in equal measure—very unlike Mourinho(reactive) or Guardiola (excessively proactive). His knack of identifying a weakness or a soft underbelly in the opponent was well illustrated in the CL semi-finals this year as well as in the quarter-finals of the same competition 2 years back. Facing Barcelona, Simeone had particularly instructed his men to hound Jose Pinto, not the most confident of keepers, and forced multiple turnovers. Causing mental and physical fatigue is something Atletico enjoy as a hobby. In a nutshell, Atletico are one of the most enviable sides in the world right now. Playing at one of the most terrifying stadiums in the world and backed by the roaring Calderon crowd, they have now eliminated Barcelona and Bayern Munich back-to-back in what has been portrayed as a giant-killing story. But that's where the misconception is rooted. Atletico Madrid are giants themselves, European heavyweights now, who can beat any team on sheer teamwork and tenacity. And then some skill. A tough-to-beat army commanded by a wicked general, Atletico are now serial winners. They will waste time, throw balls on the pitch to stop counters, stuff the living daylights out of “more skilled” teams, waste time (having won matches by a scoreline of 1-0 12 times this season, it should not be a surprise that they are the masters of wasting time towards the fag end of matches), and put their bodies on the line but they will not buckle. Atletico enforce their brand of football on opponents, unlike any team in world football right now. They are, what the Joker called in The Dark Knight, the immovable object. And they almost met the unstoppable force in Bayern in the second leg and on the balance of play, probably should have come out on the losing end. But they did not, and find themselves in the final again. Time to bust those ghosts of Lisbon 2014.